Time to slide around in your fashionably stockinged feet! 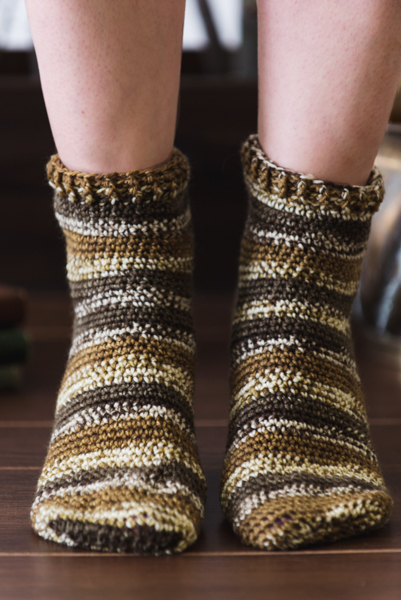 Because they are worked from toe to heel, these socks are a great first pair for someone who has never attempted crocheted socks before. Each sock is worked from toe to cuff. Mark the first stitch of round with a stitch marker. To make the sock larger or smaller, adjust gauge by using a smaller or larger hook to naturally change size. Ch 18, sl st to first ch to join. Rnd 1: Ch 1, work 24 sc in ring, sl st to first st to join – 24 sts. Rnd 2: Ch 1, *sc in next 3 sts, 2 sc in next st; rep from * around, sl st to first st to join – 30 sts. Rnd 3: Ch 1, *sc in next 4 sts, 2 sc in next st; rep from * around, sl st to first st to join – 36 sts. Rnd 4: Ch 1, *sc in next 5 sts, 2 sc in next st; rep from * around, sl st to first st to join – 42 sts. Rnd 1: Ch 1, sc in each st around, do not join. Rnds 2-30: Working in continuous rounds, sc in each st. Note: You can make the sock longer or shorter by increasing or decreasing rnds here. Rows 1-9: Ch 1, turn, sc in next 21 sts. Row 10: Ch 1, turn, sc in next 7 sts, sc2tog, sc3tog, sc2tog, sc in next 7 sts – 17 sts. Row 11: Ch 1, turn, sc in next 5 sts, sc2tog, sc3tog, sc2tog, sc in next 5 sts, turn, sl st to first st of row to join – 13 sts. This will leave an opening that will be sewn together to finish. Rnd 1: Ch 1, use the end of rows as edges, sc in next 11 sts, sc in next 21 sts across top of Foot, sc in next 11 sts on opposite edge, sl st to the first st to join – 43 sts. Rnd 2: Ch 1, 2 sc in the first st, sc in each st around, do not join – 44 sts. Rnds 3-16: Working in the rnd, sc in each st, sl st to first st of the last rnd to join. Note: You can make the leg longer by adding more rows before working Cuff. Rnds 1-2: Ch 2 (does not count as a st), *fpdc, bpdc; rep from * around, sl st to the first st to join. Rnd 3: Ch 1, *fpsc, bpsc; rep from * around, sl st to the first st to join. Fasten off. Using tapestry needle, sew the heel and toe together. I am just getting into making socks, whether they are knit or crocheted. 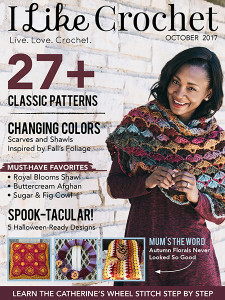 I want to say thank you so much for an awesome and beautiful pattern. Going to give them a try. Thanks. Love them, going to give them a try. Thanks.